Link your Act! software with the popular AccountRight range of products. The Xact Link for Act! & MYOB is an application which allows Act! users to connect to selected MYOB accounting products; in doing so it enables users to view MYOB customer information, and update and enter customer data to MYOB - all from within ACT!. Important note: Compatibility for this product does not include the latest AccountRight Live products. Integration to these products will not be available until MYOB make addon integration available. Pricing for this product is based on a per user basis and is a one-off cost. The Volume Discount applies only to the "one time purchase" and is not part of any previous purchases. This pricing does not include the Act! software. More information regarding Act! can be found here. Import MYOB Customer and Supplier Cards into ACT! Create and update Customer Cards directly from ACT! View Customer Card details and Sales History from within ACT! New! View MYOB Customer Credit notes from within ACT!. New! View MYOB Customer Payments from within ACT! New! For customers with price levels applied in MYOB; when creating sales documents users will receive a prompt to apply the new price when the customer reaches the minimum quantity of items as designated for that price level. View Aged Receivables from ACT! Create Quotes, Sales Orders and Invoices direct from ACT! Email Invoices, Quotes etc. direct from ACT! Full reporting functionality including Card Reports, Integrated Lookups and Advanced Queries using SQL. Users can create tables, pie and bar charts. 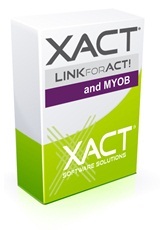 Improved integration with Xact Time & Billing for ACT! - users can now convert multiple Time & Billing Tickets to a single MYOB invoice. *Note this feature list is for the link between ACT! and MYOB only. To view the features list for ACT! click here.